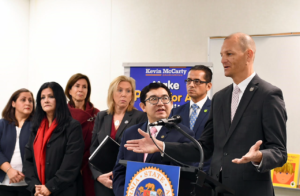 Assemblymember Kevin McCarty announces legislation to increase funding and expand high-quality Early Learning opportunities for California’s neediest kids. (Sacramento, CA)– Today, Assemblymember Kevin McCarty (D-Sacramento) introduced a legislative package which makes quality Pre-K more accessible to California’s 3- and 4-year old children and their families, particularly those most in need. The package includes three bills designed to increase low-income children’s opportunity for success by 1) implementing Universal Pre-K in communities where families are experiencing poverty, 2) funding additional Pre-K facilities, and 3) reforming state funding across Early Learning programs to increase teachers’ pay and improve working conditions. “I want to ensure that the needs of California’s youngest residents and their families are front and center as we begin the new legislative session. All children deserve a fair start and lack of access to quality early learning opportunities is limiting their prospects for future success. This package provides long term benefits, not only for families trying to break the cycle of poverty but also for California’s economy as a whole,” said Assemblymember McCarty. There is now strong evidence that high-quality Early Learning programs can improve Kindergarten readiness and put children on the path to succeed in school and life. The benefits are particularly strong for children who are dual language learners or living in poverty. Although California’s annual state budget currently allocates about $1.2 billion to provide free Pre-K to approximately 175,000 low- and middle-income families, there are still thousands of needy 3 and 4-year-olds who don’t have access to these critical programs. “Half of California’s families can’t access Pre-K for their 3- or 4-year olds. We’re failing these children. California should lead the nation in prioritizing funding for quality, affordable Pre-K for the kids who need it most,” said Patricia Lozano, Executive Director of Early Edge California, which is co-sponsoring AB 123 – The Pre-K for All – act along with Kidango. Raising quality by increasing training and supports for Early Learning teachers and programs. Early Edge California is a nonprofit advocacy organization dedicated to improving access to high quality Early Learning experiences for all California children so they can have a strong foundation for future success.